Vacuum Tube Mic Preamp. 12AX7 Vacuum Tube. +48V Phantom Power, 20dB Pad. $45.99 Seen a lower price? This premium tube mic/line preamp features an integrated limiter for studio, live and hard disk recording applications. It features a carefully-selected 12AX7 vacuum tube with Behringer's UTC technology for exceptional warmth and lowest noise. Using the MIC100 is a great way to eliminate the "dull" sound of standard digital recorders & sound cards. Also, it perfectly complements studio-grade condenser mics. When used as a high-end DI-box, it ensures outstanding signal integrity. Features also include a phase reverse switch, +48 V phantom power, a 20 dB pad, and balanced I/O. 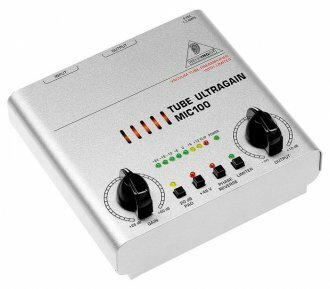 The heart of the Tube Untragain is an extremely low-noise microphone preamp circuitry that uses discrete components and produces a highly trans-parent sound. 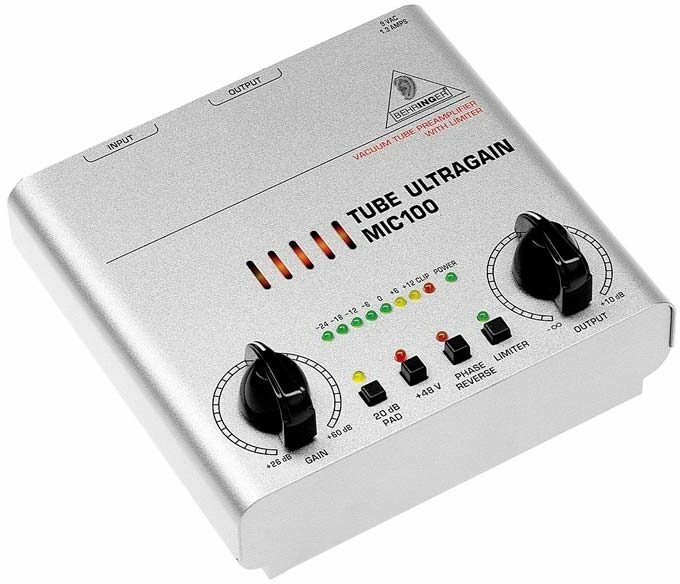 In combination with Behringer's tube technology, the operational amplifiers 4580 and a sophisticated circuit topology, the Tube Untragain yields excellent noise and distortion properties. The innovative UTC circuitry that has been developed by Behringer's engineering team offers an abundance of sound-shaping possibilities. Absolute musicality was Behringer's major goal when they designed the Tube Untragain. The result is a device that, thanks to its tube circuitry, lends an incredible punch to percussion instruments. On the other hand, instruments that are rich in upper harmonics will receive more transparency. The sound will be warm, detailed and brilliant. Available until 11 PM (EST) today. Mention special code 1ZY-KDS0 when you call.